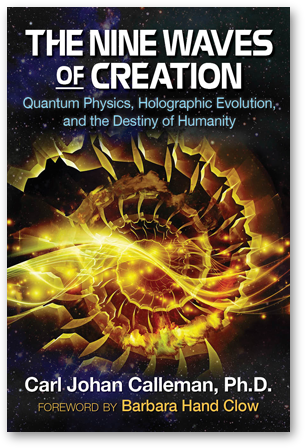 Presenting a quantum-holographic perspective on world history and human consciousness, Carl Calleman explains the quantum physics behind the Waves of the Mayan Calendar system and how these Waves allow us to understand the shifting eras on Earth as well as the possibilities of the future. He describes how, prior to the activation of the 6th Wave in 3115 BCE, our social systems were based on a unified cosmic order, but the hologram of this Wave shifted society to an all-consuming focus on Good and Evil, leading to the rise of patriarchal religious structures, slavery, and warfare. He explores how later Waves and their new holograms helped humanity survive the negative effects of the 6th Wave, such as the Industrial Revolution of the 7th Wave and the Digital Revolution of the 8th Wave. In 2011, the 9th Wave was activated, bringing with it an accelerated push for a more egalitarian world, a rising awareness of unity consciousness, and access to the full power of all Nine Waves of Creation. Calleman explains how our individual resonance with each Wave plays a role in the quality of our lives and how we must consciously work to resonate with the higher Waves. Revealing how we can become quantum activists in a holographic world by aligning with the 9th Wave, the author shows how we each can help manifest the destiny of humanity hinted at in ancient texts. Carl Johan Calleman is a scientist and philosopher with a Ph.D. in physical biology from the University of Stockholm. Recognized for his theory that the Mayan calendar reflects the evolution of the global mind, he is the author of several books, including The Global Mind and the Rise of Civilization. He lives in Santa Fe, New Mexico.